We love getting out in the field and shooting. Here you’ll find a list of some of the events we offer from time to time. Field Events are photography expeditions that last less than a day and generally focus on in-the-field photography rather than classroom instruction. However, often our field events can be extended to multiple partial days (evenings), because, hey, when you’re in a great place, there is always more to shoot. Field events may fall on week days, too – because they are often selected to coincide with events we can’t control: meteor showers, eclipses, etc. Discounted pricing available until June 8, 2018. 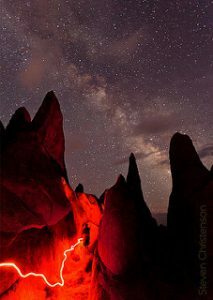 Join Astronomy Photographer of the Year winner, Steven Christenson for one or two nights (your choice) in one of our favorite places in the world: Alabama Hills. This group will be kept small so it will be a fun hands on experience for all! We know where to go to get the most interesting formations paired with the Milky Way, or your favorite Star Trail, and of course capturing Perseid Meteors. We'll have plenty of time after sunset to collect star trails and Milky Way images . We will finally retire for slumber in the wee hours - if you can sleep, that is given the celestial fireworks that will be occuring. We don't guarantee you'll see flaming fireballs but you will undoubtedly spy a few bits of flaming space dust. In Alabama Hills the days are hot, but the nights are glorious. We strongly suggest you book a room at the Dow Villa as soon as possible (other accommodations are available, too, including several other motels and fine area campgrounds). This Field Expedition is not for beginning photographers. You will need to know how to operate your camera and be comfortable walking around in the dark with minimal light. To attend you also must sign and return a Waiver of Liability. There is no formal classroom instruction for this Field Expedition, but we will meet informally at lunch time on the following day to compare notes and catch up! Please read our cancellation policy. In brief there are no refunds except for the conditions listed. Weather is unpredictable. We feel confident that we can show you compelling photography opportunities in all but the worst weather. Since we cannot control the weather, however, we cannot be responsible for the result. 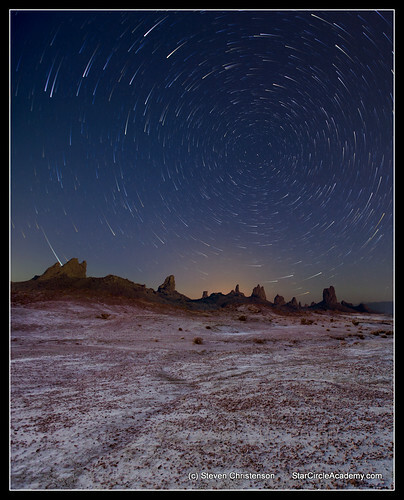 Join Astronomy Photographer of the Year winner, Steven Christenson and world class photographer and storm chaser Matt Granz for one or three nights (your choice) in the eerily other-worldly desert landscape of Trona Pinnacles. This group will be kept small so it will be a fun hands on experience for all! 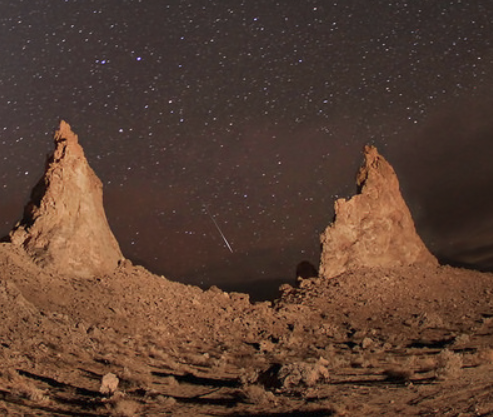 We know where to go to get the most interesting foreground formations paired with constellations, or your favorite Star Trail, and of course capturing Geminid Meteors - the most energetic meteor shower of the year. We'll have plenty of time after sunset and before moonset to collect star trails and Astrophotography Landscapes. We will finally retire for slumber in the wee hours - if you can sleep, that is given the celestial fireworks that will be occurring. We don't guarantee you'll see flaming fireballs but you will undoubtedly spy a few bits of flaming space dust. In Trona Pinnacles it may be warm to freezing in winter. We suggest you book a room in Ridgecrest (the nearest major town). 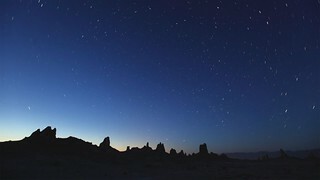 Trona Pinnacles, however is BLM land and you CAN camp there for a small donation if you are prepared and wish to do so. This Field Expedition is not for beginning night photographers. You will need to know how to operate your camera and be comfortable walking around in the dark with minimal light. However we will teach you the rest. To attend you also must sign and return a Waiver of Liability. There is no formal classroom instruction for this Field Expedition, but we will meet informally at lunch time in Ridgecrest the following day to compare notes and catch up! What is an Equatorial Mount? How do they work? Setting up an Equatorial Mount - polar alignment. Using an Intervalometer (or) an automation program to capture images. Tips to make the whole process easier. 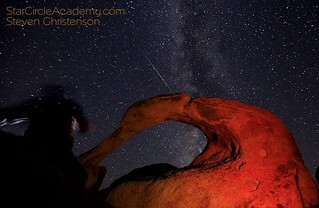 Note: It is not necessary that you have already attended Astrophotography 101, but it is recommended. 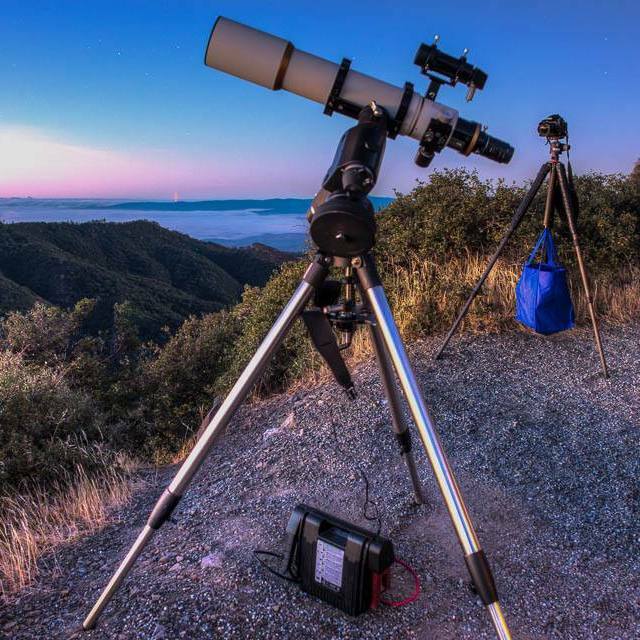 By registering for this event, you'll get access to the next Astrophotography 101 Webinar and an online video for only $12 more.